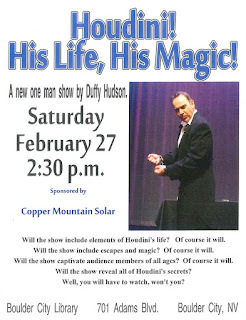 Actor Duffy Hudson will perform his Houdini one man show at the Boulder City Library in Boulder, Colorado on Saturday, February 27th at 2:30 PM. I had the pleasure of seeing Duffy debut his show in South Pasadena last month. If you're in the Boulder area, I'd recommend checking it out. More information at the Boulder City Library website.